I never imagined that winning the bid for a stay at the Pit River Lodge at our annual auction would turn into one the most memorable times I've had fishing ever. I just had to let everyone know how grateful June and I are for the generosity of Paul at the Pit River Lodge for donating to PFF the stay at his lodge which included one day guided fishing and all our meals which were nothing short of fabulous. We had beef Wellington, rack of lamb, and shrimp and scallop pasta for dinner! The lodge is famous in the area for its cooking and they have to limit the number of locals who can come for dinner on the weekends. The dinners were very special. The chef came to us each late afternoon and asked us when we would like to have dinner and if we had any special requests. I've never that happen in all my years. The dinning atmosphere allowed private dinning or if you wished an opportunity to exchange stories with the other guests. Turns out there is a very highly-rated golf course just up the road and many of the guests stay there on a golf package. 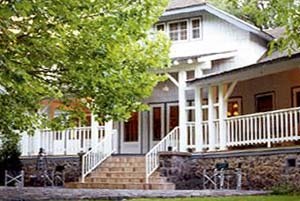 This is a great place to stay for golf and fly fishing lovers, alike. PG&E once owned the lodge for use by its executives as a retreat. Its circle driveway lined with maple trees leads you around the large grass area up to the lodge. It has a nice homey feel decorated I'd guess from the 40's and 50's. There are several rooms in the main lodge and a few private cottages on the grounds as well. There are two nice dinning areas and a pool table in it's own room. We had our own room with private bath, located at the end of the lodge, which gave us our own private porch to sit out and enjoy the late afternoon and evening air. June and I enjoyed the Power tower in it's art deco styling proudly displaying it's history. Paul was going to be our guide, but due to do the death of his stepson to a hunting accident that weekend, he had many other things to attend to. So he arranged for us to be guided by Bill Downs. Bill is a self-admitted fly fishing addict. He was tying knots and flies since he was seven years old. Bill took June and me to the upper Fall River which is realistically only available by private access. That part of the river has over 4200 trout per mile (the Madison in Montana has 3000). It was thrilling to see schools of trout swim away from our slow moving boat as we made our way to the spot Bill had chosen the day before to be our spot to fish. The day was just a gorgeous Fall day with ducks fling over and flocks of red-wing blackbirds taking off from the trees that lined the river. We also saw yellow-breasted blackbirds, a young golden eagle, and cranes. I had requested that Bill spend more time teaching us to fish and help us learn from our mistakes. He was a great and patient instructor. Turns out he guides and instructs for Clearwater House's "Mastery of the art of Fly Fishing", a five-day course that includes lodging, meals, and instruction for only $1050. I was very pleased with what I had learned about fishing a z-wing olive with a micro midge tied six inches below. The dry fly acted as an indicator for the midge. You really need to have a sharp eye on the fly and NEVER take your eye off the fly and be ready to react. Bill emphasized the proper way to release a fish. He never lifted it out of the water and first tried to use pliers to unhook the barbless hook. Failing that he would wet his hands and left the fish by its belly and calm the fish until the fly could be removed. After fishing all day, we were able to hook into over twenty fish, none of the ones we brought to the boat for releasing reached under twelve inches, most were a fat fifteen inches, the largest a very fat seventeen inches. In spite of the large numbers of fish, being all wild fish, they were not an easy catch. I had such a good time, I decided to take Bill's offer to fish half a day on the Pit River right next to the lodge. Bill said he would teach me how to nymph fish the river and show me that the Pit river is no where near as hard to fish as it's reputation says. Bill and I left at 8AM and walked past the Pit River Powerhouse 1, over a bridge, and fished at the base of the bridge. It only took him two casts to land a nice eleven inch fish! Immediately impressed, following his lead I cast out three times and I landed another. He used his excellent teaching skills and fishing knowledge to help me really learn how to nymph fish with and without an indicator. The crowning point of the day was landing two fish with a very short line without an indicator on a micro nymph in a rushing white water pool where I never believed fish would be lying in wait. I can't recommend Bill more. I have had at least ten guides and he was able to convey the most advanced methods in a way I could understand. Sometimes he had to try several methods for me to finally get it, but he never gave up, nor was he at a loss to try another way to make his point customized to my learning method. Bill can be reached through Clearwater House, the Pit River Lodge or at 530-335-5070 during the season and in the off season at 415-945-0790. June and I continued our trip by visiting Lassen National Parkundefinedfamous for the volcano that erupted in 1915-18 and it's mud pots. We stayed one night on the Feather River where I used Bill's knowledge to catch four trout on a very heavily fished section of the river in an hour-and-a-half. I must admit I felt pretty darn good at the end of the day on the river.